Every trader needs to know that we all make mistakes. The trick is to recognize those mistakes and try to fix them as quickly as possible so you don’t repeat it. 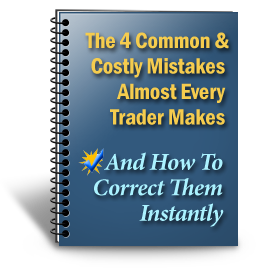 This Special Report shows you the 4 most common mistakes that virtually every trader will make at some point in their career. These mistakes can be very costly, too. That’s why it’s so important to learn how to recognize and eliminate them from your trading. Download this important Special Report here.